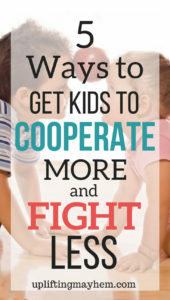 5 Ways to Get Kids to Cooperate More and Fight Less! With 4 very strong willed children in our home, fighting tends to happen…A LOT! I think if I were to pick the one thing that sends me over the edge more than anything else it would be fighting. Its amazing how a peaceful moment can escalate into utter chaos with just one child starting an argument. Pretty soon they are ALL arguing and I’m yelling at them to stop and….peaceful moment gone! Fighting also turns into tattle-telling which is also drives me insane! I’m writing about this because it’s something we deal with on a daily basis. I don’t think there is ANY magic bullet that’s gonna make your child cooperate all of the time. It’s just part of life. When dealing with it on a daily basis, though, I have found some things that help. I will share and hope that anyone reading will also share what has worked for them. It’s great to learn from others experiences. After all, what good is it to go through all of our parenting mishaps unless we can learn from our own mistakes and successes as well as others? Oh boy! This is the hardest one, right? Why can’t our kids follow what we say and not what we do? 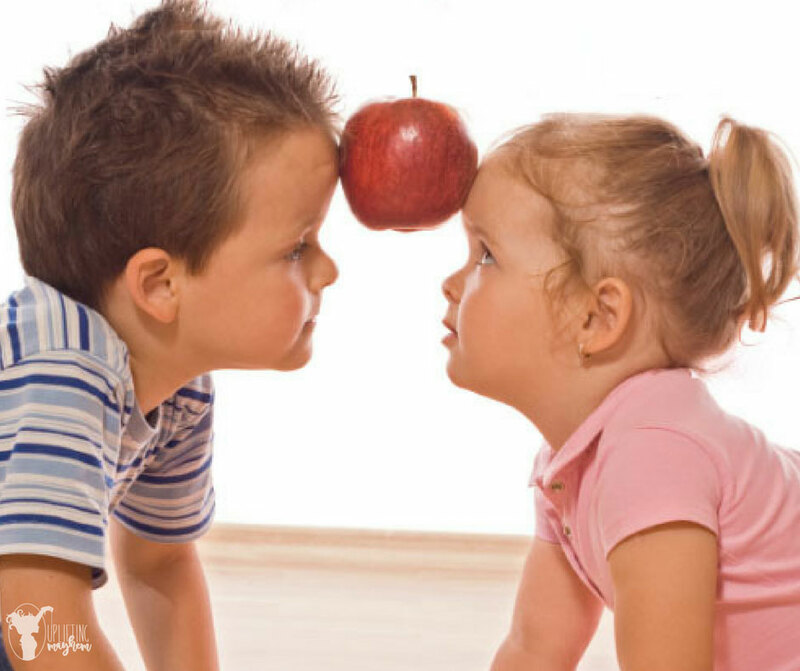 🙂 Studies have shown that if parents can resolve their differences and show love towards one another in front of their children, that their children learn to do the same with their siblings and peers. It’s not a bad thing for kids to see their parents having arguments (I personally believe it’s good) as long as they can also see that you can resolve those disputes. If parents always fight behind closed doors, children grow up with a false sense of what marriage is really like. In life we ALL have issues getting along with one person or another. What’s most important (according to me) is how we handle it. Is it ok to fight in your house? Is it ok to scream, hit or belittle? Where do you draw the line? Make sure your children know what the rules are and what the consequences are. My kids tend to fight the most while they are sitting together at the table eating. (I thought eating together was supposed to bring family unity 😉 ) We have a rule now that if they argue or fight they will be excused to go to their room. If their food gets cold as a result, too bad! 3. Try to stop the escalation. If you’ve been a parent long enough, you know when an argument will quickly turn into a knock down drag out fight. Distraction can work for younger kids but older ones take a little more trick. My mom used to sing a hymn called, ‘Let Us All Speak Kind Words to Each Other’ whenever we were arguing.We would get so annoyed at HER that oft times we would stop arguing just to stop her singing! (: Read my post here about how singing crazy songs has helped me in mothering. I have also taken the 2 that were fighting and made them sit in the rocking chair together until they got along. Ever watched the movie The Parent Trap? If they can’t get along, they must need to spend more time working together! 4. Use Media for good. It doesn’t matter if only 2 were fighting and 1 wasn’t. Digital entertainment is just that….entertainment. It is not a necessary part of life and, therefore will be banned if our family is not getting along. Family relationships will last far longer than electronic devices and matter far more! 5. Spend more time together. At the beginning of every summer I have to gear myself up for an increase in contention at my house. You see, they go from being in school all day to suddenly being with their family all day and it’s almost like they have to learn to live with each other all over again! The more time you spend with your kids the stronger the bond and more you all learn to get along! One way I have found to do this recently is to play games together. Games can lead to fighting too when children don’t win or think someone cheated. 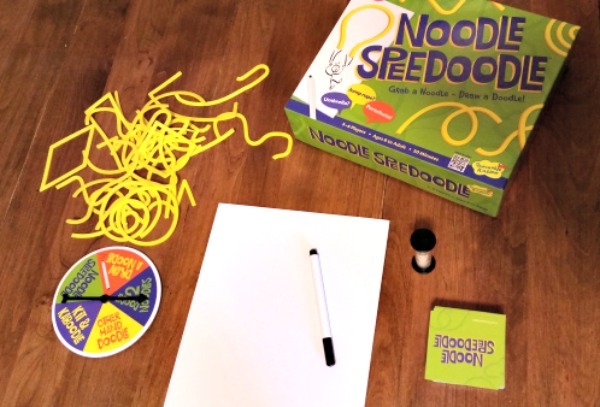 They sent us 3 games: Noodle Speedoodle, Say the Word and What’s It? All 3 of these games have won several awards and all are wonderful games that teach my family to work together to reach and end goal. Love it! Game time was so much more peaceful while we played these. Below is our experience with Noodle Speedoodle. So basically, they had to pick a noodle from the pile (the doodles are all shaped differently) and then a card with 3 words. They then had to pick one of the words and try to draw that picture while incorporating the shape of the noodle in it somehow. Even my 5 year old was able to play this with us and we all had a lot of fun. There are 5 ways to play this game, although we haven’t tried them all. I’m sure this will be a family favorite. Thank you to Peaceable Kingdom for helping to teach kids to GET ALONG! I’ve already decided I want to buy some of their other games to add to our collection. Hoot Owl Hoot and Count Your Chickens are already in my Amazon cart for Christmas! 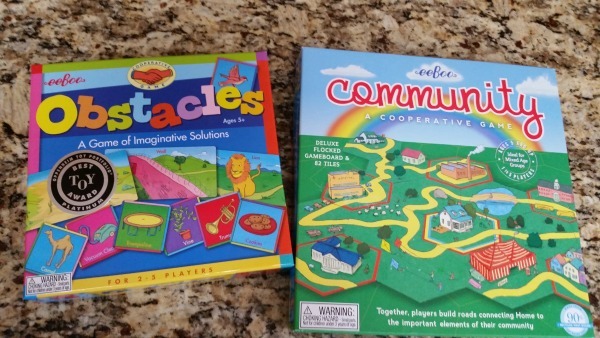 You can find Peaceable Kingdom Cooperative games on their site here or on Kiddlywinks and Amazon. Love it! It’s always hard when you have a family with lots of kids of different ages and you sit down to play a game. Either the bigger kids complain about having to play with the younger ones or the younger kids cry because they can’t figure out the game and therefore can’t win. 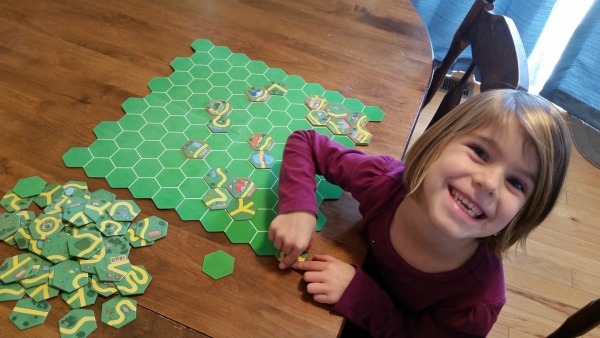 Family Pastimes sent us some games to try. This was kind of a memory/process of elimination game. If you turn over all the clocks before you guess what 3 items are under the ‘trap door’ then the game is over. Every time you get a match you get one step closer to guessing which items might be under the door. In a normal matching game everyone gets as many matches as they can to see who wins at the end. In this game we all took turns but helped each other in the decision of which pieces to turn over to find matches. The more we worked together the better chance we had at winning. When we lost the first round I found myself (even as an adult) wanting to play again! 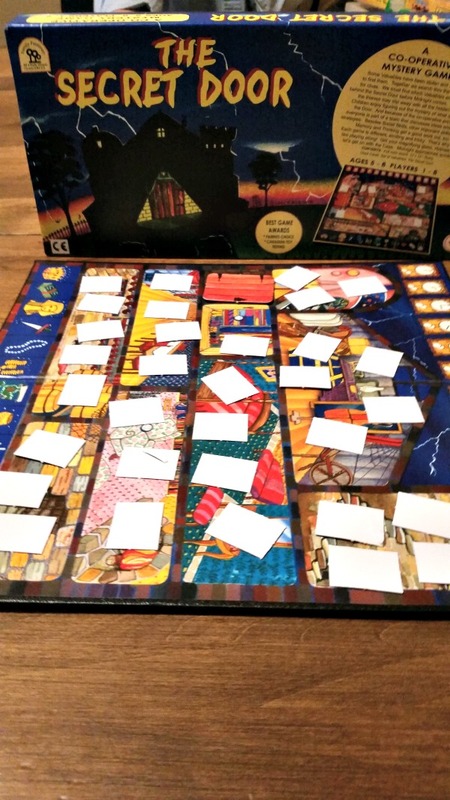 My kids also pointed out that this game could even be played with 1 person! Family Pastimes has also just made a free online version of Max! You can download it here. If you want some simple easy games for your kids to play while also teaching them to cooperate with one another, I highly recommend Family Pastimes. You can buy their games on Amazon or by contacting them on their website here. 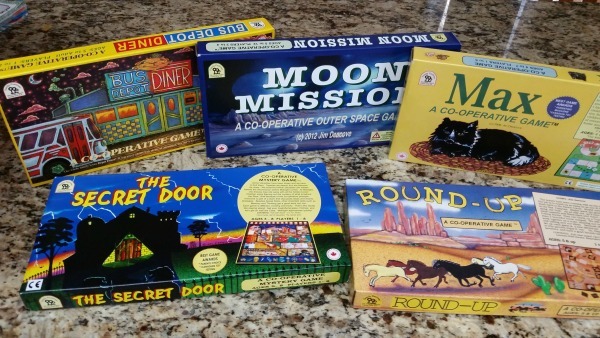 EeBoo is another great company that we contacted because I noticed they had some good family cooperative games as well. They sent us 2 to review, Obstacles and Community. 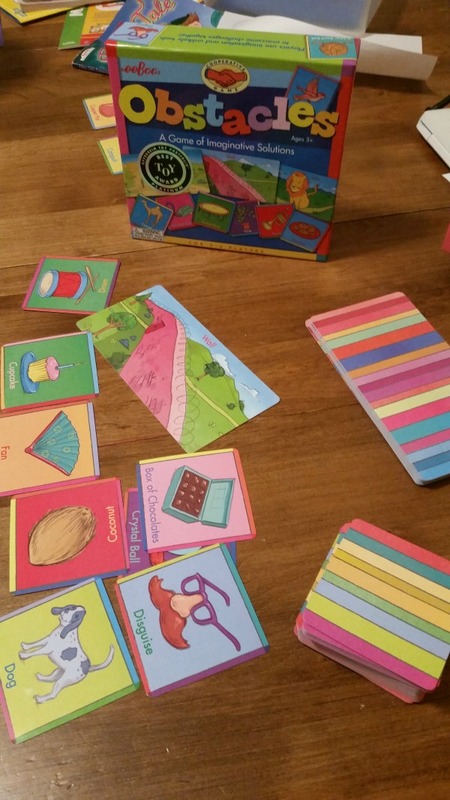 My kids had a lot of fun playing Obstacles and using their cards to creatively decide how to overcome each obstacle. In this particular picture they were trying to figure out how to get over the wall. It got pretty funny to see how we all used our imagination. One of us had a card with fireflies on it and decided that the fireflies could help us get over the wall if we tied strings to them and let them ‘fly’ us over! Another had a trampoline and decided that it would help them ‘jump’ over. In the end, we worked together to decide who had the best idea. This game is perfect for very young children. It says on the box 5 and up but I know even 3 year old children could play. The other game, Community, is a fun game that challenges players to build a community together. This game reminded me of a game my husband and I like to play with our married friends. I love that the game board is flocked so the pieces stay right where they belong and don’t slide around. Brilliant! EeBoo also had other games that I really want to try (we may have a very large collection of games this Christmas! 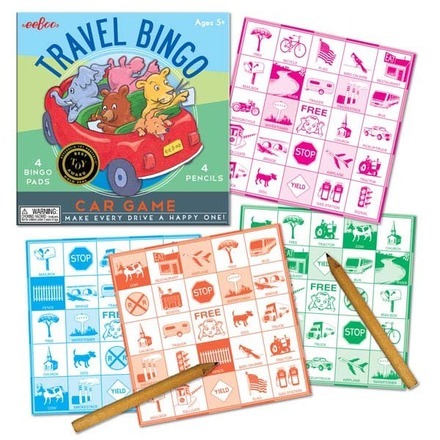 😀 ) Their travel bingo game looks like a lot of fun and might also help with the fighting and whining that goes on in our car. EeBoo games can be purchased at www.eeBoo.com. I’m looking forward to playing a lot more games as a family! 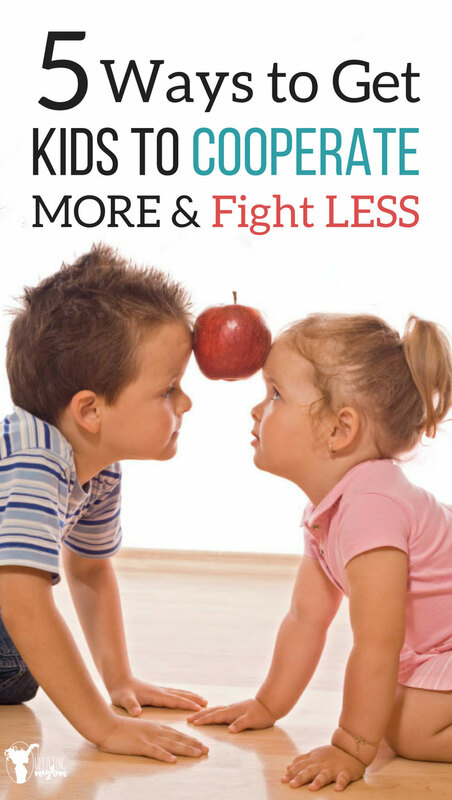 What ways have YOU found to get your kids to cooperate more and fight less? Please share! Podcast #4 – What Would Your Future Self Say?